Product prices and availability are accurate as of 2019-04-09 22:55:33 EDT and are subject to change. Any price and availability information displayed on http://www.amazon.com/ at the time of purchase will apply to the purchase of this product. 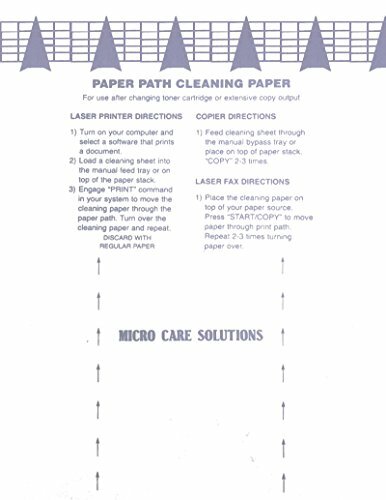 Simply run a sheet through your printer as you would any sheet. Watch it remove the dirt particles from the internal paper path as it appears on the sheet. At 8.5 x 11 inches it will clear away dust, paper & dirt particles as well as excess toner resulting in crisp copies and trouble-free operation. Eliminates service calls when used regularly. Recommended use is once a week on an average printer. 20 sheets per package. Reusable up to 20 times.